HaOlam, official weekly journal of the Zionist Organization, edited by N. Sokolov. Tzvi Hirsch Itzkovitzki, Cologne. Volume of issues from the first year: issues 1-52, January-December, 1907. Volume with the 52 issues of the first year of the weekly HaOlam. The weekly was the official organ of the Zionist Organization in Hebrew, and its name is a translation of the movement's German-language newspaper, Die Welt. The newspaper included articles with the questions of the time, segments of literature and poetry, Jewish content and history and letters to and from the editor. 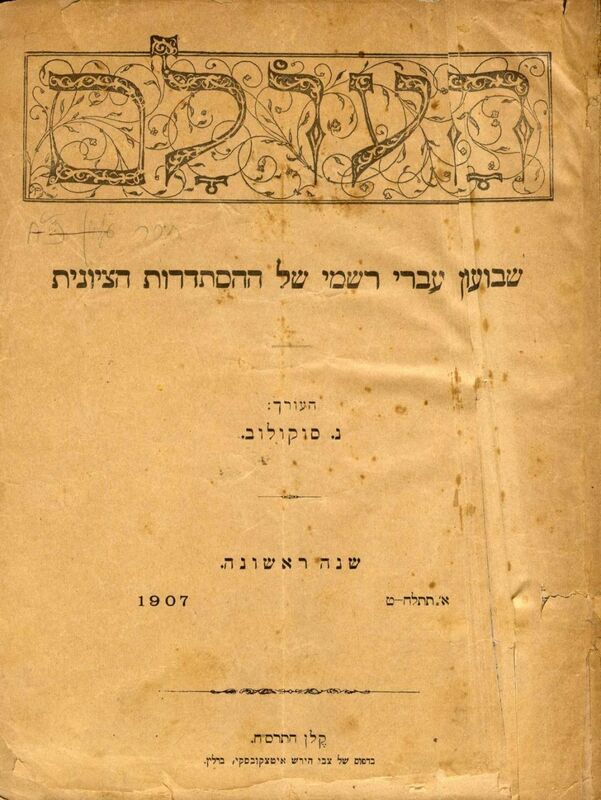 The editor of the newspaper was Nachum Sokolov, and the writers included Eliezer Ben-Yehudah, Joseph Klausner, Mendele Mocher Sefarim, Itzhak Katzenelson and others. Detached external spine and binding. Stains. Fine condition.